Please read all information and application instructions before beginning! If you have any questions feel free to contact us. If any of the following conditions exist, it is good practice to heat the metal surface to be painted beforehand with a heat gun (keep Velox Plus Paint, acetone and any other flammables at a safe distance). Never wash surface with acid. If the metal surfaces to be painted has just recently been removed from the water. Conditions where dew may form on the metal surfaces. High humidity and temperature. If applying Velox Metal Primer while the dew point is between 65°F (17.5°C) and 74°F (23.5°C). This heating practice will dry the metal surface well enough to ensure the Velox Metal Primer adheres to the metal. Once the surface has been heated, let it cool to ambient temerature before applying the Velox Metal Primer. Application of Velox Metal Primer on running gear: temperature, humidity and dew point. Velox Metal Primer and Velox Plus Paint should NOT be applied at temperatures below 41°F or above 95°F. The temperature of the metal parts to be coated must be higher than the dew point. It is not recommended that Velox Metal Primer be applied when the dew point is higher than 74°F (23.5°C). Green colored cells show temperature/humidity levels at which it’s ok to apply Velox Metal Primer. Yellow cells show temperature/humidity levels at which some attention must be paid before applying Velox Metal Primer. 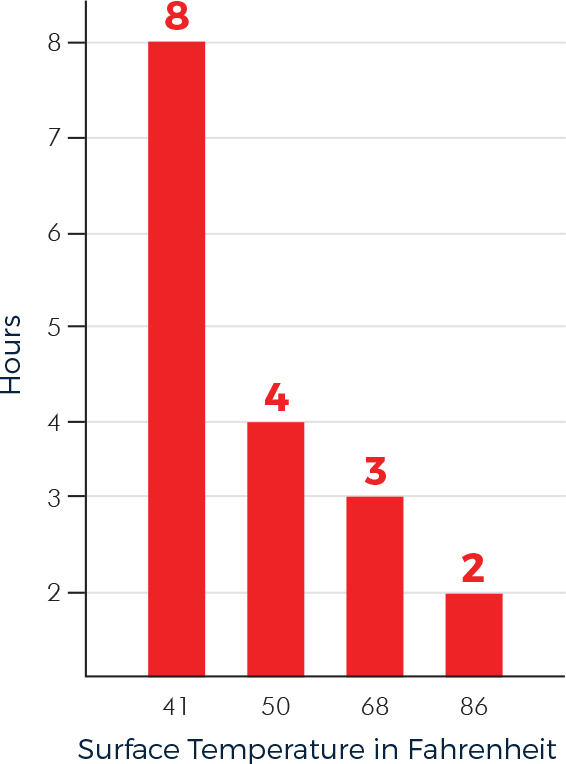 Red cells show temperature/humidity levels at which we DO NOT recommend applying Velox Metal Primer. Primer and Velox Plus Paint are available in 1/4 liter, and 1/2 liter cans. Normal coverage is approximately 4 square meters (43sq.ft) per 1/2 liter. Flat surfaces, trim tab and rudder coverage is approximately 5 square meters (53sq.ft) per 1/2 liter. 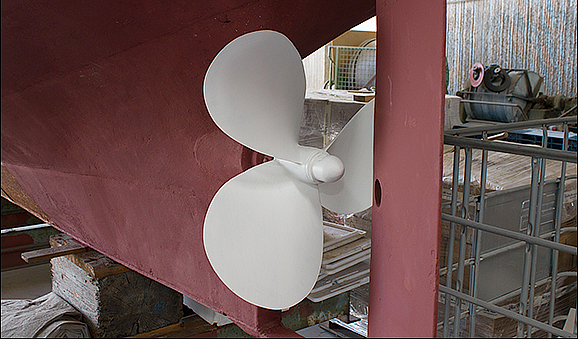 Propeller or stern drive coverage is approximately 2.5 square meters (26sq.ft) per 1/2 liter. One 16” four blade prop will use approximately 1/8 liter for each coat. One 30” four blade prop will use approximately 1/4 liter for each coat. One 40” four blade prop will use approximately 1/2 liter for each coat. IMPORTANT: With a Scotch-Brite pad, scuff the Velox Plus painted surface either after allowing a full cure or just before launch to ensure proper leaching of the biocide. Wear suitable protective clothing, goggles, mask and gloves as prescribed! 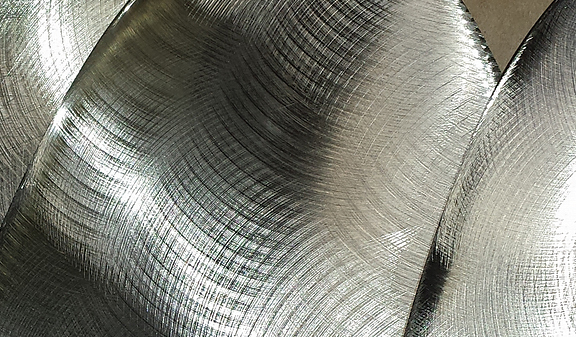 All metallic surfaces must be rough and clean. For cleaning grease and dirt use only pure acetone. When a new clean rag with fresh pure acetone stays clean, the prop is clean. Never wash surface with acid, water, soap, detergents or degreasers! Do not touch the cleaned surface with bare hands, this will leave traces of grease or dirt. Do not apply when the metal surface temperature is below 41°F or above 95°F. Aluminum - should be protected with an appropriate epoxy coating before the metal primer is applied. 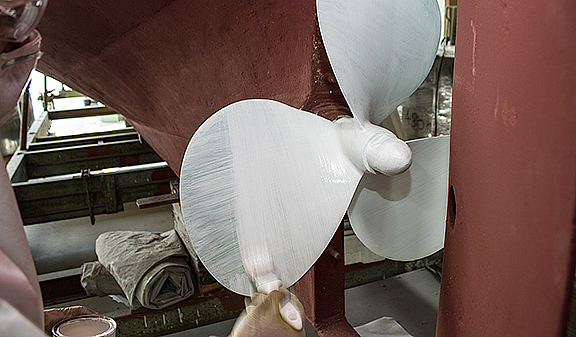 This is not necessary when aluminum is already protected with a factory finish (such as new stern drives). For epoxy factory finishes, sand the surface with a abrasive pad (like Scotch-Brite) or fine sandpaper (180-220 grit), removing all gloss or shine before applying Velox Metal Primer. Stainless Steel - must have Velox Metal Primer applied immediately after sanding and cleaning with acetone the stainless steel because stainless steel will oxidize if not immediately primed after sanding. 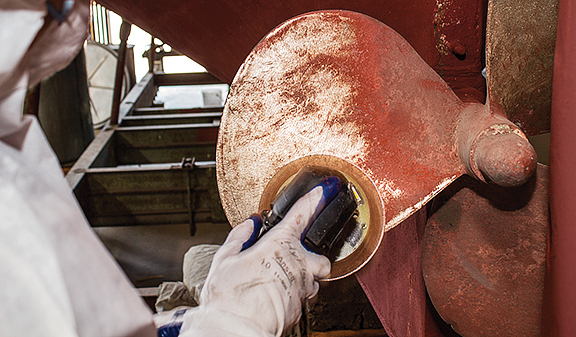 Remove all existing antifouling or other coating using 80 grit sandpaper. Use either a dual action rotary sander (we suggest using a soft pad in order not to damage the propeller). We do not recommend sanding by hand, as it is very difficult to achieve the proper abraded finish without a power tool. It may be necessary to sand corners and difficult to reach places by hand. Be aggressive in these spots. 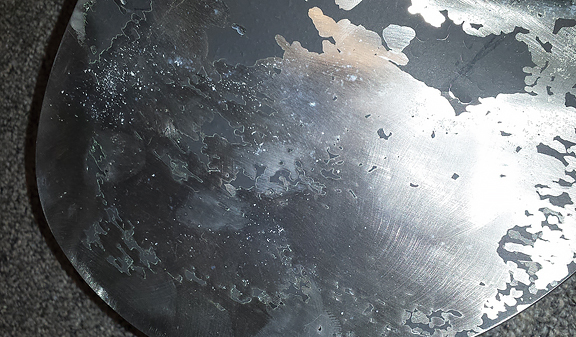 Do not remove factory finish from aluminum surfaces, such as stern drives. It is ok to apply over solid base of Velox Plus Paint from the previous season. Do not use wet sandpaper. The surface must be very rough after sanding. 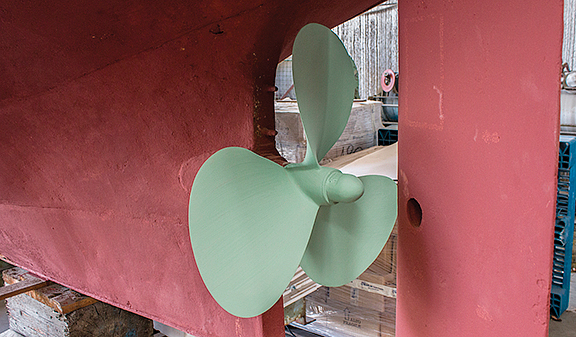 See page 4 for examples of properly sanded propellers. Removing old antifouling and sanding with power sander. Aggressively sanding hard to reach spots with 80 grit sand paper. Clean surface with pure acetone. All smooth surface shine must be removed by sanding. Do not use sandpaper that is coarser than 80 grit or anything finer. Do not use worn out sandpaper. Do not use Scotch-Brite. A sandblasted profile applied by an experienced professional is an acceptable finish. *Note for professional - Do not silicone or glass-bead blast. 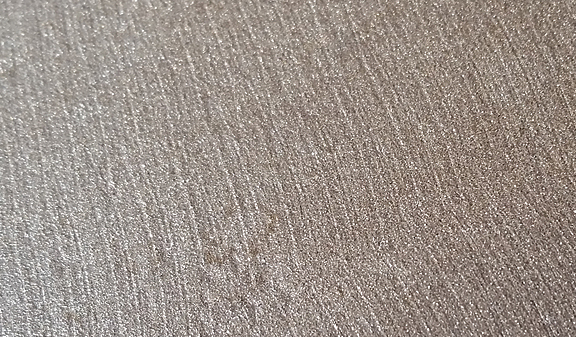 Sand-blast is the most effective finish. Is My Prop Sanded Enough? 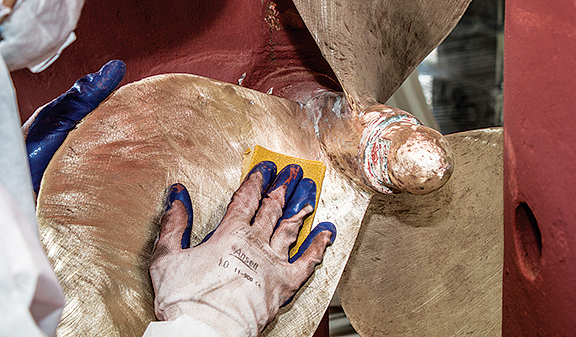 It is extremely important to remove all existing antifouling by sanding the surface down with 80 grit sand paper. The image on the left shows a prop blade not sanded thoroughly, while the image on the right depicts a prop that has been sanded down thoroughly. You should be able to feel the abraded surface when you run your fingernail across the surface. 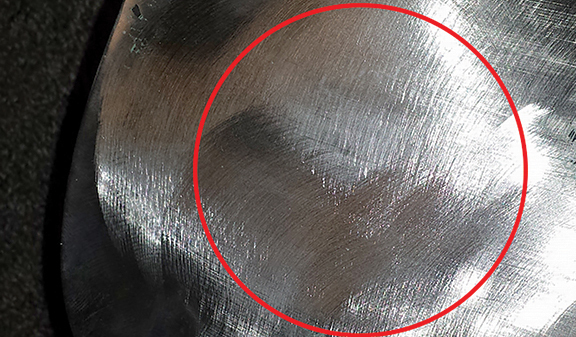 Red circle showing same prop sanded thoroughly using 80 grit sand paper. 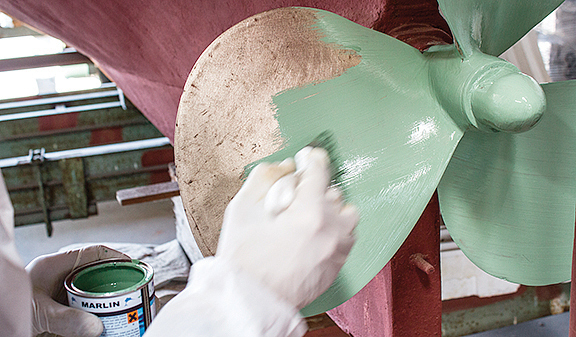 A Max-Prop propeller sanded thoroughly using 80 grit sand paper. Wash and degrease all metallic surfaces carefully with only pure acetone. Use a clean rag and change it often, when a new clean rag with fresh acetone stays clean, the surface is clean. This is very important for new or folding/feathering propellers, which usually have more grease on them. Wash and degrease all metallic surfaces with pure acetone. Close up of the clean surface ready for metal primer. Velox Metal Primer is very thick, so make sure to stir the Velox Metal Primer thoroughly for three to five minutes before applying. 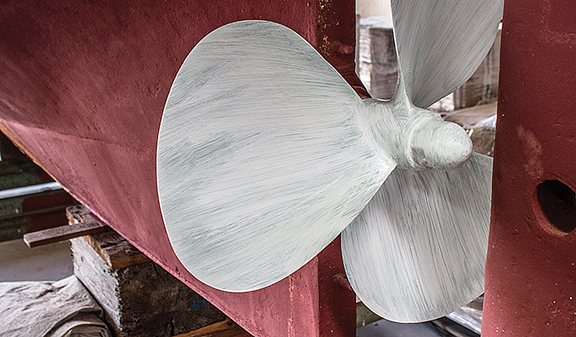 Apply one light coat of Velox Metal Primer (maximum wet film thickness 100 μm, dry film thickness 30 μm). 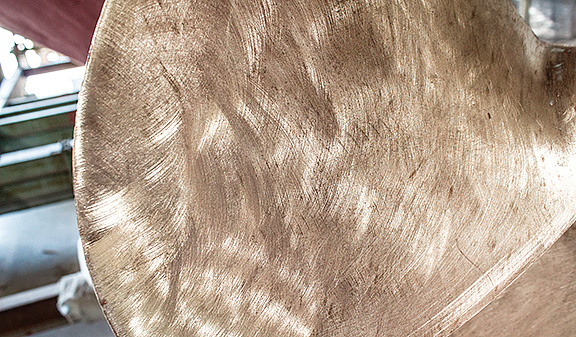 We suggest applying Velox Metal Primer with a small or medium sized brush. A light coat is desired, as applying thicker coats than recommended may result in the Velox Metal Primer not adhering properly. Brush out any runs or drips immediately that may form when applying Velox Metal Primer. Carefully check the edges of the blades for runs after applying each coat. Primer must dry according to dry time chart above. Thoroughly stir Velox Plus Paint for three to five minutes before applying. Do not apply Velox Plus Paint on bare metal. Only apply Velox Plus Paint over Velox Metal Primer supplied with Velox Plus Paint. Apply one coat of Velox Plus Paint by brush (wet film thickness 100 μm, dry film thickness 30 μm). Apply with continuous long brush strokes. Avoid going back and forth on the same spot, as this will soften the Velox Metal Primer and can pull the primer from the metal. Full coverage will not be achieved with the first coat of Velox Plus Paint as seen below. The first coat should slightly soften the primer, showing some of its green color. 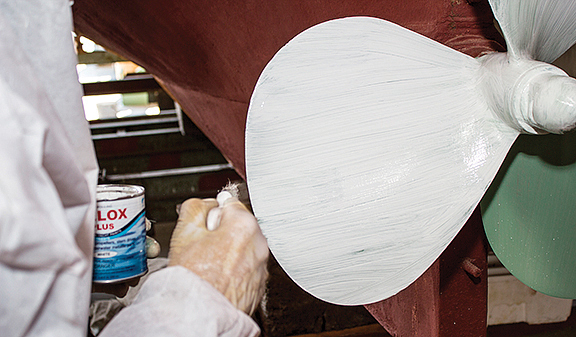 Brush out any runs or drips immediately that may form when applying Velox Plus Paint. Applying first coat of Velox Plus Paint. First coat of Velox Plus Paint. Wait at least 3 hours at 68°F (20°C) or refer to the dry times chart, and then apply a second coat of Velox Plus Paint (wet film thickness 100 μm, dry film thickness 30 μm). For best results, apply it by brush or roller with long and continuous strokes, perpendicular to the brush strokes of the first coat. A third coat of Velox Plus Paint may be applied to obtain perfect coverage or in areas where fouling growth is particularly aggressive. Applying second coat of Velox Plus Paint. Velox Plus fully dried and ready for launch. Wait at least 12 hours at 68°F (20°C) before launching. 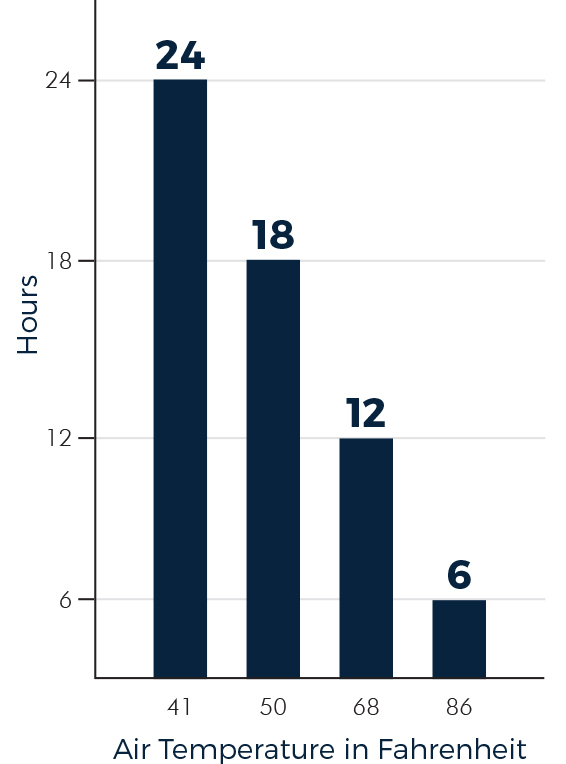 See page 1 for chart launch times at other temperatures. You can apply another two coats of Velox Plus Paint to the previous season of Velox Plus Paint. Refer to steps 5-6 for applying. Clean and lightly sand the surface with fine sandpaper or abrasive pad (like Scotch Brite). 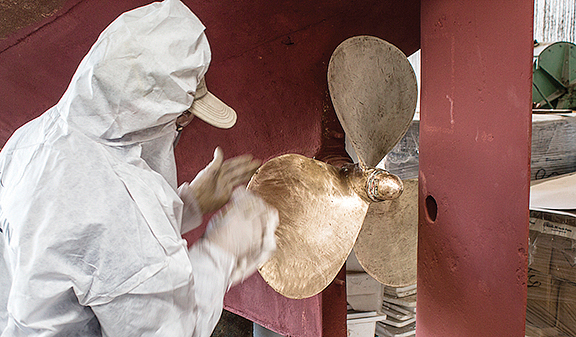 We suggest removing all the antifouling paint in any case at least every three years. 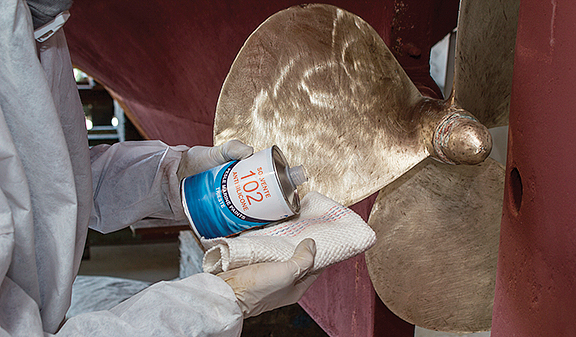 Do not apply Velox Metal Primer or Velox Plus Paint on any other antifouling. Brush out any runs or drips immediately that may form when applying Velox Metal Primer or Velox Plus Paint. Carefully check the edges of the blades for runs after applying each coat. Carefully read the instructions on the label and always wear suitable protective clothing, goggles, mask and gloves as prescribed.